Rourkela, fondly called the ‘Steel City of Odisha’ is ensconced amidst the beautiful hills and rivers. This scenic city gained prominence after the installation of the first steel plant in India. Revealing the ethnic tribal heritage of Odisha, Rourkela Tourism is perfect for spring vacations, picnics, shopping and delving into the varied culture of the state. 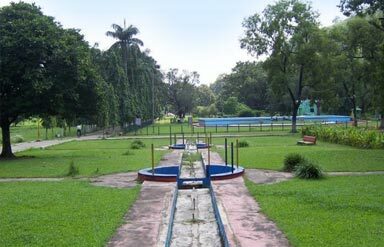 Sightseeing in Rourkela involves parks, lakes, gardens, temples and a lot more. History of Rourkela reveals that it was covered by dense forests serving as the hunting ground for the royal kings. After the installation of steel plant in 1955 with West German collaboration, Rourkela had the highest number of Germans residing in it, after Germany itself. The Steel Authority of India (SAIL) operates the steel plant. Do taste local Oriya delicacies like Chungdi Malai, Dahi Machha and Bhindi fry during your Rourkela Trip. You will find a combination of South-Indian and Bengali flavour in them. Try the fish fry in Kerala style and you will simply love it. It is one of the main tourist attractions in Rourkela, created and maintained by Rourkela Steel Plant Authority. The park offers opportunities for picnicking, boating and enjoying the toy train ride. Spread over 30 acres of land, it is situated next to the Ring road. It has its own small zoo, aquarium, doll museum, artificial lake and an observation tower. Bear, Nilgai, Rabbit, Crocodile and Spotted Dear are some of the common animals in this zoo. Birds like Peacocks, variety of parrots, Storks and Fowls are a treat to the eyes. 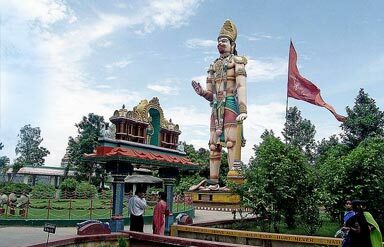 This 75-feet-tall statue of Lord Hanuman is located in the garden called Hanuman Vatika. The sculpture was designed by Togu Laxman Swamy who is a famous artist of Andhra Pradesh. It took 2 years for its completion. Today it boasts of being the tallest statue of a Hindu deity in Asia. Many other temples of Lord Shiva, Lord Jagannath, Lord Somenath, Maa Vaishno Devi and Lord Rama are also seen in its vicinity. Perched on Durga Hill, Maa Vaishno Devi Temple is thronged by large number of pilgrims every day. One has to climb nearly 630 stairs to reach the temple. The presiding deities are Goddess Saraswati, Goddess Kali and Goddess Lakshmi. The temple was finally completed in 2003 with proper steps and water tanks. It is built as a replica of original Vaishno Devi temple. Built across the Sankh River, this dam facilitates the water supply to the nearby cities. It was constructed during 1957-1959. It offers a picturesque view along with the boating facilities. A beautiful garden near the dam is an added tourist attraction. Carry a picnic basket and come down with your family to enjoy the happy hours of your vacation. 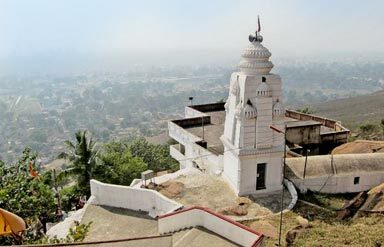 Rani Sati Temple (20km), Ghogar Baba(27km) and Darjeeng (50km) and Deodarha(50km)are some of the popular getaways to explore with your Rourkela Travel Guide. Ispat Market and Gajapati market are the two most famous shopping destinations of the city. Wooden toys, straw mats, colourful clay, trinkets made of shell, handbags and carves statues made of soap-rock are some of the popular items to purchase. You can also buy silk fabric, filigree and handloom textiles from these markets. October-March is the best time to visit when the weather is cool and pleasant. Vishwa Karma Puja (September-October) is also a sought after time to indulge in the festive ambiance of the city. Air: The town has a private aerodrome which is limited to access. However, you can travel to Bhubaneswar airport and then take a local train or a cab from there. Rail: Direct trains are available from Kolkata, Ranchi, Hyderabad, Mumbai and Chennai for Rourkela Railway station. Road: Buses are available from most of the major cities of Odisha and Jharkhand for this tourist destination. Book for Rourkela travel today and enjoy the scenic splendour conglomerated with the modern face of Odisha. Get started, right away!